For NVISO, I’m providing Wireshark training at BruCON Spring 2018: Wireshark and Lua Programming. During my “Packet Class: Wireshark” training, we do an exercise on importing a hex dump in Wireshark. I recently created a 010 Editor script to help with the creation of hex dumps for Wireshark. In this video, I’m trying to give you an idea of what you can expect in my “Packet Class: Wireshark” training when we will cover protocol dissectors written in Lua. This is a topic I’m teaching in my “Packet Class: Wireshark” training in Amsterdam next month. 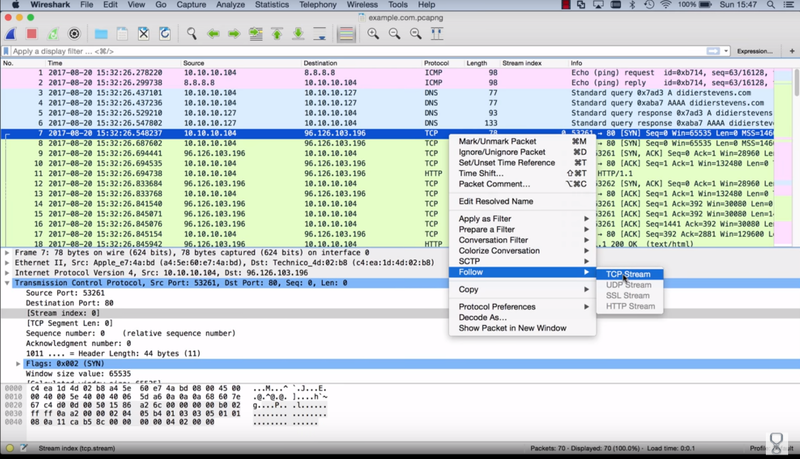 You can configure Wireshark to display TCP flags like Snort does. One way to do this, is to create a post-dissector and then add a column with its output (like in the screenshot above). And then my Python program lua-dissector-generator.py takes this input and generates a Lua post-dissector with one new protocol + field, using an existing field. To promote my Hack In The Box Wireshark training, I’ll start to publish some Lua dissectors. Here is a screenshot of my TCP Flags dissector. It was generated (and adapted) with my Wireshark Lua dissector generator. It displays TCP flags like Snort does. You can clearly see the SYN – SYN/ACK – ACK phase of the first TCP connection (packets 1, 2 and 3).